Lawyers and PR firms tell companies to flatter Trump. The Hot New Corporate PR Strategy? Giving Trump Credit for Stuff He Didn’t Do. 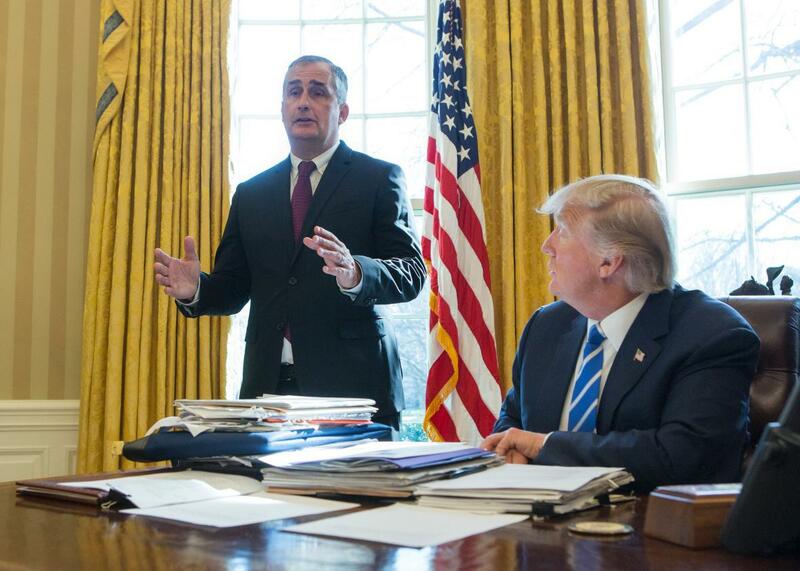 Intel CEO Brian Krzanich speaks during a meeting with President Donald Trump at the White House on Wednesday. Lawyers and public relation experts are advising their S&P 500 clients to take a leaf from the US president’s media playbook and find ways to deliver Mr Trump news he can claim as personal victories. “People have understood that Donald likes to win and they need to play into that,” said another lawyer, who worked for Mr Trump during a high-profile bankruptcy case in the 1990s. “The basic strategy is to look at whether you have made an announcement in the past that you can rehash” to align with the president’s election promises. It has seemed obvious for a while that this would become standard operating procedure during the Trump years. SoftBank CEO Masayoshi Son demoed the playbook back in December when he stood side by side with the then-president-elect to announce that his company would invest $50 billion in the United States and create 50,000 jobs. It soon emerged that the money would come from a tech fund the Japanese telecom giant had started with Saudi Arabia in October. The obvious subtext of the meeting was that Son, whose company owns the majority of Sprint and has long dreamed of a merger with T-Mobile, was trying to curry some favor with the new administration on the cheap. So here we are. Trump’s economic policy is a toxic combination of tax cuts and deregulations that will enrich shareholders and already wealthy executives, paired with bellicose trade rhetoric and publicity stunts to give the impression that he is creating jobs for average workers. Out of fear or self-interest, corporate America appears to be playing along with the charade.